Our solutions are born of creativity, experience, and innovation. 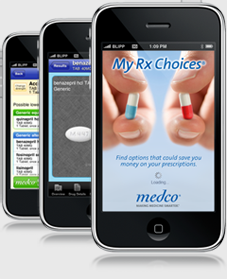 iPhone application and mobile web project for finding prescription drugs and their related generics. Find alternatives that could save you money, research interactions, view images and buy them securely at Medco. Our Mobile solutions combine clean design, mobile user experience, & scalable programming. All with detailed metrics for measurable results.